The Five Great Elements, Fire, Air, Water, Earth and Ether are represented by Bhagavan. In other words, He became the Five Elements, the same elements which constitute the Universe and us. His beloved consort is Bhagavathee ! She is the eternal Universal Mind which brought the Universe into being. Everything is created by Her. All knowledge and wisdom are Her knowledge and wisdom. All existence is Her existence. She is the Creatrix and the Generatrix. She is the energy in the blazing Sun. She takes millions of forms and roams the Universe. She upholds the Cosmos and is the Leading Divine Light, the generatrix of all Vedic sciences and arts. The six main sciences, the Veda Shaastras and the six auxiliary sciences, the Vedanga Saastras, flow out of Her Wisdom Body ! She gives Wealth to those who seek it and Wisdom to those who seek wisdom ! Without Her Grace, neither material prosperity nor spiritual salvation is possible ! She is Transcendence. She is Nescience. She is the Ultimate Knowledge, the Knowledge of the Absolute or Brahmajnana ! She is the Supramental Shakti, converting our obscure physical mentality into Her supramentality ! Please take me under your care ! I prostrate before Thee ! 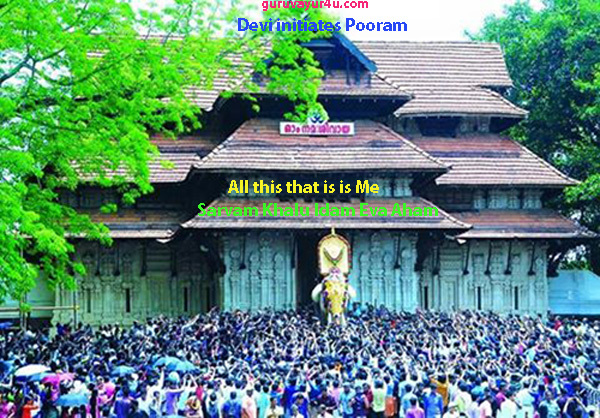 The main festival here is the Pooram Festival, which occurs on Feb - Mar. Lakhs attend this festival. This temple is located in Wadakkancherry in Trichur Dist.